Get $10 in Free Fandango Movie Credits! Via MilesQuest, you can get 2 free $5 Fandango credits to use towards movie tickets! You can NOT use more than one $5 credit on a single ticket. But you can get 2 codes per person, per email address. So you can get a $10 discount off 2 movie tickets. Visit the Fandango site and enter your date of birth. Enter promotional code “CS8436” in all the boxes. View your confirmation page and then click the “Enter More Codes” button. Enter the same code “CS8436” in all 5 boxes again. You Can Enter Code “CS8436” to Get a 2nd $5 Credit! 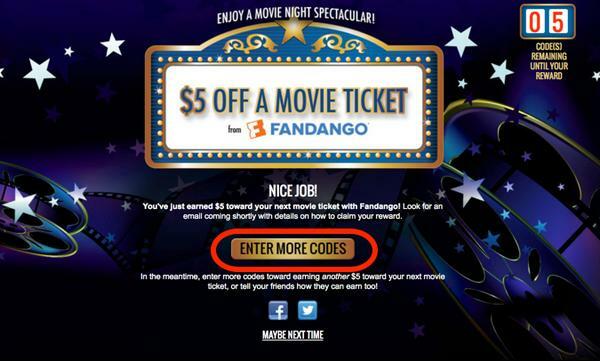 You will receive 2 emails from Fandango which contain separate codes for each of your $5 credits. 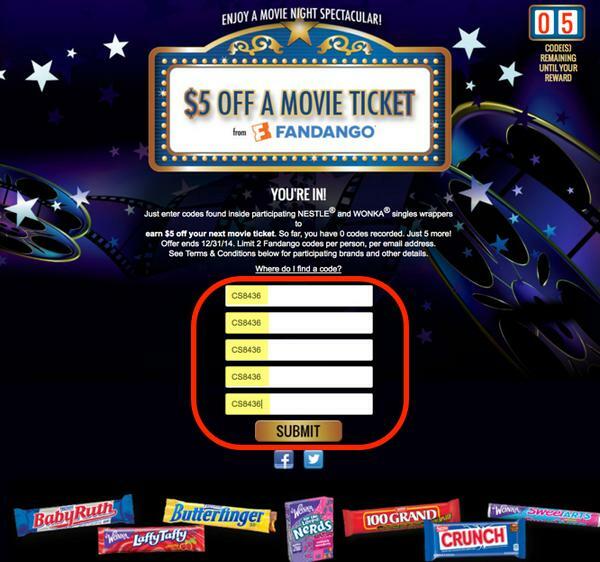 To use the codes, create a Fandango account and enter the codes at check-out. Note: You can’t use both $5 coupons on 1 ticket! Use a Shopping Portal for More Savings! 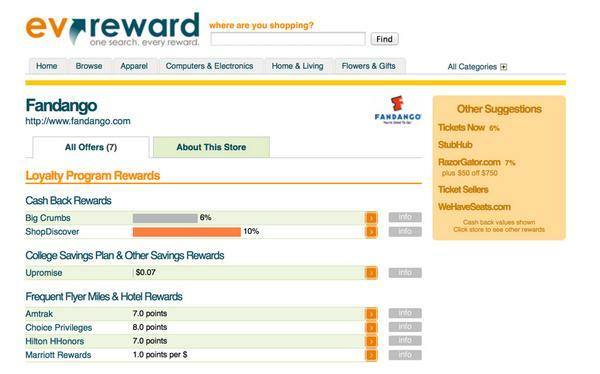 Before you check out, you can go through a shopping portal to earn a few extra points or cash back. Just check evreward to find the best deal. So if you plan to see a movie on Friday and your tickets cost more than $10 each, this is a better deal. You can get 2 free $5 credits by entering code “CS8436” on the Fandango promotional page. But keep in mind that you can only use one $5 credit towards a single ticket. You must use your credits by January 31, 2015. But you may be able to get a better deal if you use your Visa Signature card to get Buy 1 Get 1 Free tickets to see a movie on a Friday. 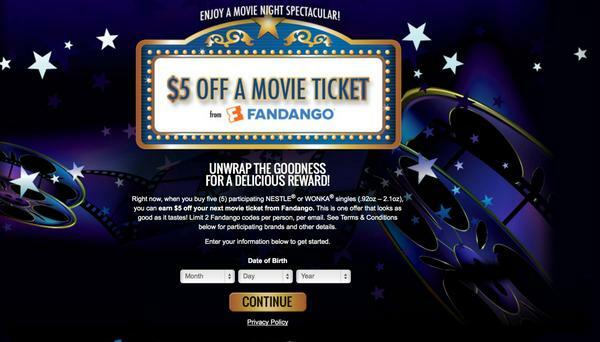 NESTLÉ- FANDANGO MOVIE TICKET OFFER. 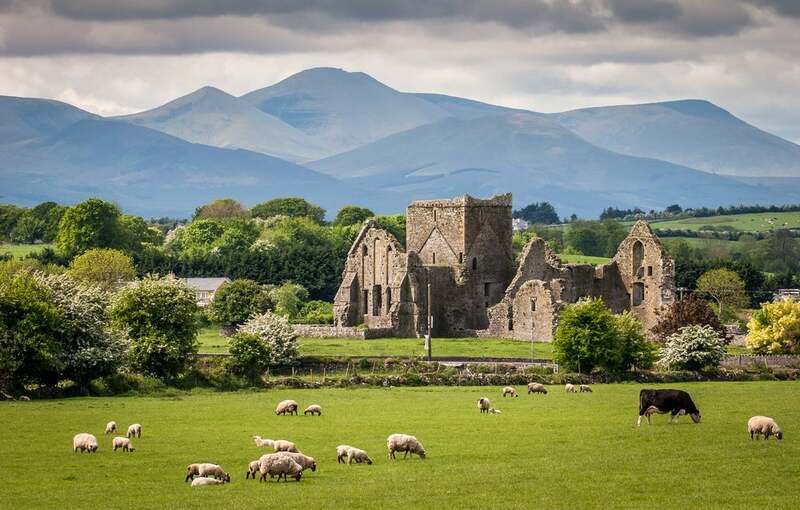 Unfortunately, due to a significant amount of fraudulent activity Nestlé has ended this promotion. Looks like we can’t use Fandango gift cards also when using this promo. It’s one or the other. Just bought a bunch of discounted gift cards too. Thanks for the tip Daraius !!! Its easy and can be done in no time !! !